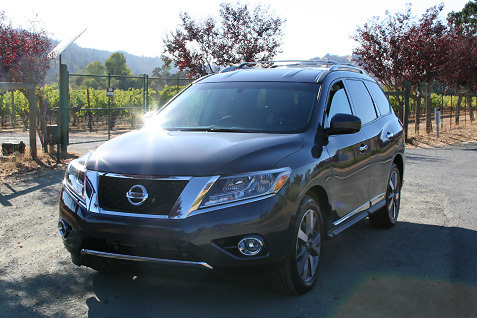 Nissan invited us out to wine country near San Francisco to test drive the all-new 2013 Nissan Pathfinder. Nissan has been a leader in the large SUV category for years with the Pathfinder, and the 2013 model represents the 4th generation of this vehicle. This segment has evolved through the years as the various manufacturers have moved from a body-on-frame truck design to a more carlike unibody construction. The result is a more comfortable driving experience, even for these large SUVs, and the Pathfinder is no exception. With the 4th generation Pathfinder comes an all-new exterior which represents a nice improvement over the previous model. The front end in particular offers a much cleaner design. The headlights are larger and the angled grille looks like it belongs on the vehicle. The lines on the front hood and near the fog lights accentuate the grille design as well. Overall, the vehicle retains enough of the rugged feel of earlier versions, yet also has a classy, upscale look as well. The 7-passenger Pathfinder is loaded with interior features that will make drivers and passengers feel very comfortable. The new Pathfinder boasts best-in-class interior passenger volume and best-in-class front headroom and front legroom. It’s definitely roomy and you can load this vehicle up with adults and kids no problem. You can get all of the comfort options you would expect, heated and cooled front seats, heated 2nd row seats, heated steering wheel, power tilt and telescoping steering wheel, push button start, multiple user memory settings and an advanced Bose Audio System with 13 speakers. The Pathfinder also features easy 3rd row access from the 60/40-split 2nd row with innovative technology that lets you access the 3rd row even when an empty child seat is still in the second row. Buyers can also choose a Dual Panorama Moonroof, with sliding opening front panel and fixed rear glass panel which extends over the 2nd and 3rd rows. You should definitely check out this option. I was able to push the Pathfinder pretty hard around some winding roads through Napa and Sonoma and was very impressed with the handling on this large vehicle. The Pathfinder gripped the road nicely even at higher speeds. The acceleration was also solid for this type of vehicle. The new Pathfinder is the only vehicle in this segment with a CVT transmission which helps provide a 30 % increase in combined fuel economy over the previous model. Fuel economy is rated at 26 mpg highway, 20 mpg city and 22 mpg combined for the 2WD model and 25 mpg highway, 19 mpg city and 21 mpg combined for the 4WD model. The CVT performed nicely as Nissan continues to perfect this technology. With gas mileage at a premium these days, the V8 is no longer an option. I drove a model with the available intuitive four-wheel drive. Drivers can choose full-time 2WD for maximum fuel economy, auto mode to automatically monitor conditions and adjust the balance of power between front and rear wheels for best traction, or 4WD Lock mode when full-time 4WD is desired. It also features standard Hill Start Assist that helps add control when starting and driving away on a steep incline (both 4WD and 2WD models). The Pathfinder remains an excellent option in the large SUV category. It’s perfect for families and for an active lifestyle. With best-in-class standard 5,000-pound towing capacity you can use the Pathfinder tow your boat, jet skis or trailer. It’s roomy and fun to drive so it should continue to be a hit for Nissan.